Artisan Cast Metal Bar Tops Available in Eight Metals for Commercial and Residential Projects. This zinc bar top is made by combining a zinc sheet metal countertop with a molded artisan cast zinc edge profile. These two materials create a very durable surface that allows for unique design details and decorative edges. By using an artisan cast zinc edge profile on this zinc bar top, we are able to incorporate unique shapes and decorative edge profiles that are traditionally too difficult or cost prohibitive to create from sheet metals. 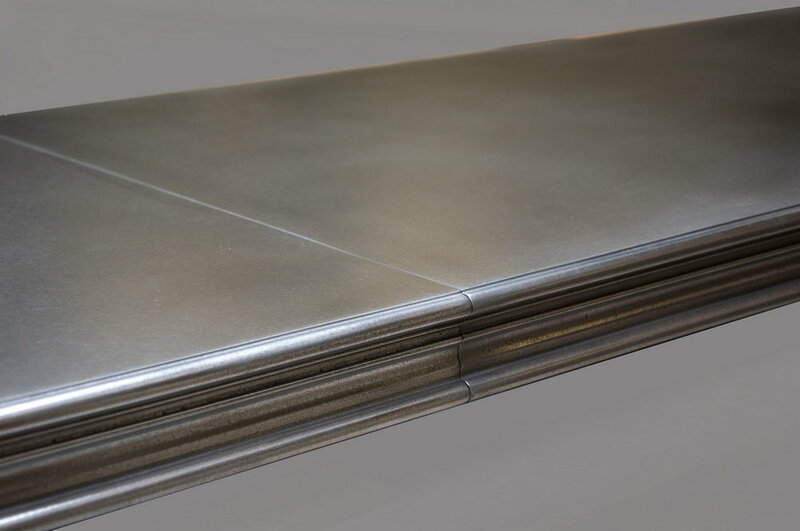 A stainless steel artisan cast bar top with a matching Stamford artisan cast edge profile. An artisan cast zinc bar top with a Stanford edge profile and curved edge. Because of the artisan cast construction, we are able to add decorative edge profiles to curved metal countertops. This artisan cast stainless steel bar top features notched corners, the Stamford edge profile, and a cutout for the top to be fitted around an existing post. An L-Shaped artisan cast zinc bar top with a curved edge and Stamford edge profile. Commercial artisan cast zinc bar top. This bar top was made for a commercial project in California and has a sheet metal zinc top with an artisan cast metal 'H' edge profile. 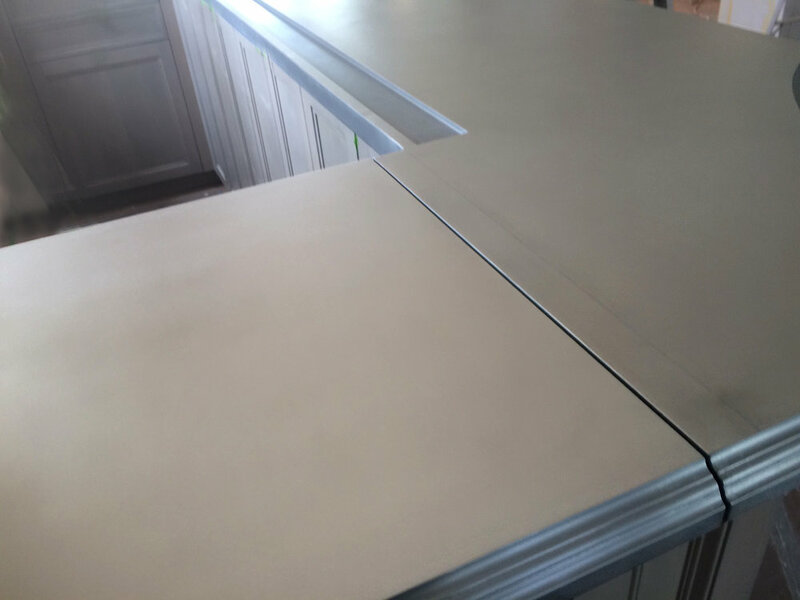 A sheet metal zinc bar top with a custom artisan cast zinc edge profile. This bar, made for a resort in California, measures 2 1/2" thick and has an 'H' edge profile. A commercial artisan cast zinc bar top with 'H' artisan cast edge profile. The edge measures 2 1/2" thick. The Bistro Collection's artisan cast metal bar tops are the best way to incorporate a metal bar top into your project without the constraints of working with sheet metals. 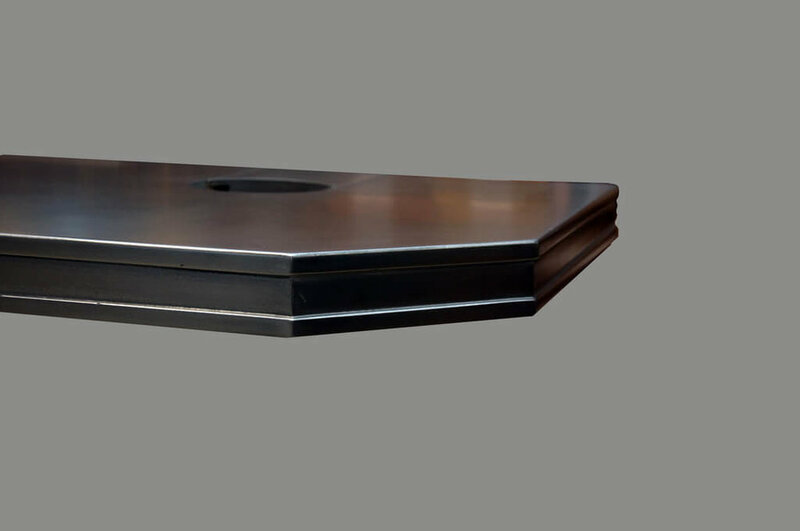 We offer two styles of artisan cast metal bar tops. One is fully artisan cast metal with decorative edge profiles. This construction is best suited for residential projects and wet bars. The other style and construction method is what we call our commercial artisan cast metal bar tops. This method combines durable sheet metal tops with artisan cast metal edge profiles. This way you're able to incorporate decorative edges and unique shapes into your durable metal tops without the material and budget limitations of trying to replicate these styles from sheet metals. This is best for commercial bar tops, or any high traffic area that sees heavy daily use.